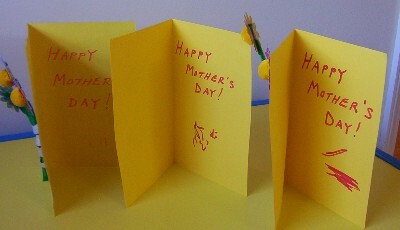 I was talking to a neighbor today and she gave me a really neat idea for the kids to give for Mothers Day. in the past we alway have done hand prints, pictures and such but this year I am taking some old shoes that my kids have outgrown and putting dirt in them and adding flowers! my neighbor has a bunch of voliets that she wants to get rid of so thats what we are putting into our shoes! ...this is fun to fill out and give to parents...answers are always cute! I just bought small wooden lidded boxes at the dollar store. I am painting them pink then the kids will be making a fingerprint flower (just the petals) and a pic of their face will be the face of the flower. I am writing on the lid Mom's Little treasures. Then the kids will be writing a letter "why I love Mom" which I am going to type making it like a scroll will "burn" the edges to make it look old then roll up like a treasure map and put in the box. I have 3 families and instead of each child doing one it will be one per family. So one box will have 3 "flowers" on top. Plus we will glue on some jewels around the outside. Mothers day gift we made last week. 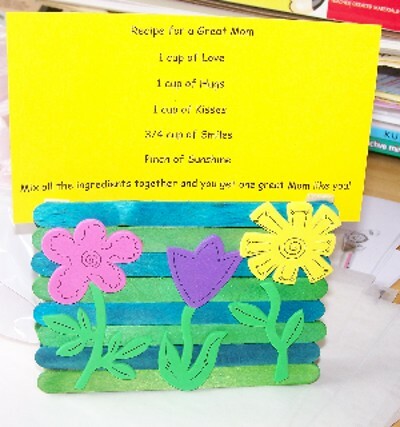 It is a recipe holder with the recipe of a for a great mom. If you cannot read it, it says: Recipe for a Great Mom - 1 Cup of Love - 1 Cup of Hugs - 1 Cup of Kisses - 3/4 Cup of Smiles - Pinch of Sunshine - Mix all the ingredients together and you get one great Mom like you! Let children paint their flower pot. Let dry. Decorate, write Happy Mother's Day, etc. Have children glue their flowers on craft sticks. 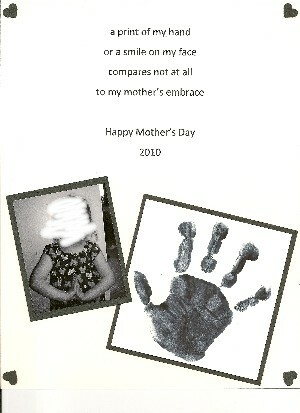 Take the child's picture and cut their face out and glue on one of the flowers. Put piece of foam brick or clay in bottom of pot, add moss. Stick 3 or 4 flowers in the pot. Instead of cutting flowers out of the fun foam, cut out the kids handprints and make those into the flowers! Very Cute! I did this one time. Cut flowers out of craft foam, made a circle in the middle for the child's picture to show through from the back. I did the whole pre-school class for the teacher who was getting married & all of the kids couldn't attend the wedding for real, so they were there in spirit. This was the public school where several of my dc kids went 1/2 day. Has anyone ever done the gluing thing to preserve the kids' shoes? we did years ago - you just dip/brush on regular school glue and let dry - do at least twice - the more you do it the harder they get though - we usually did at least 3 coats. then spray paint them gold and they look like those gold baby shoes people have actually preserved in gold... then we plant flowers in them. I started by mixing the cement (one childs at a time) when I had a good consistancy I poured it into the pan. Let it sit for a few minutes and when the cement starts to set the put a handprint in. Wash their hands right away and have them place decorations around the handprint. I bought the cement at Home Depot. The shells I picked up on vacation, but Wal-Mart has them in the craft section along with the glass beads. Well, last year I made pillows for the moms. I bought wash clothes and we used fabric paint and fabric markers. I sew them together and stuffed them, put hand print of child on front and feet on back, also their name and year, along with their age. This year I am going to do aprons for the moms, with hand prints on it from their children, stating, "hands down, best mom around". Something that the moms can wear all year long. In advance, color some rotini pasta in a variety of floral colors. Break each colored pasta piece in half. For each child, cut a 2 inch circle from white poster board or tagboard. Use a pencil to draw a small center circle. Cover the small inner circle with tacky glue and then sprinkle on some millet birdseed. Allow to dry. Spread tacky glue over the remainder of the cutout circle and arrange the pasta "petals" around the millet center. 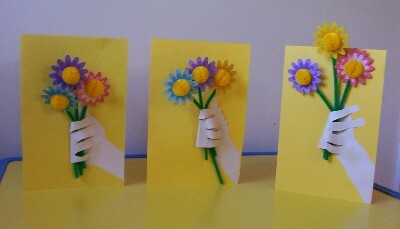 Glue on a tagboard stem and leaves, and then add a length of self adhesive magnetic tape to the back of the flower. Paint each side of an unfinished wood tissue box a different color using acrylic paints. Let dry. dab on contrasting polka dots with an unused pencil eraser dipped in paint. Let dry. Color copy four photos. Trim to fit and then glue one to center of each side. Protect with an acrylic spray sealer or decoupage glue. Make a dozen roses! Have each child make 12 red or pink paint handprints on a large sheet of white construction paper. Then each child should dip one finger into green tempera paint and paint a green stem for each "rose". When the paint is dry, glue the bouquet painting to a sheet of green floral paper. They write a note for mom on a heart shaped cutout and glue it to the bottom of the painting. the pick is really cute and resembles a vase. And cozy up with me! You touch on Mothers' Day! For mothers day I am buying cheap kitchen wall clocks and taking out the face backing and making a blank face backing. For the numbers I will have the kids put red thumbprints and paint dots and legs to make ladybugs and the center will be their handprint. I got this as a Christmas gift from my 10 yo a couple of years ago and it made me cry it was so sweet. I had my kindergarteners think of things that they like that their mothers do. Then they wrote a sentence for each, using the prompt, "I like it when...." They then illustrated the sentences and we bound them toghter for a book for our mothers. Give the children old magazines and have them cut out pictures of things that they would like to buy their moms if they could. Glue these pictures on construction paper and title it "If I could buy Mom anything...."
What about the kids making picture frames out of popsicle sticks and adding little things such as flowers, beads, etc and have the child or you write "I love my Mommy" all around the frame edge. Then put little magnets on the back, and then the parent could take it to work with a pic of their child and put on a metal file cabinet or something? Just an idea! I have an easy craft idea. Picture soap. Using flat soap, I use Ivory, and Podge glue, you cut out the child's picture and glue onto soap. Put a couple coats over the soap and let dry. Then put some glue just around the edge of the picture for the last step and let the child sprinkle with glitter. Parents love this craft. You can actually use the soap and the picture will stay on it but most parents save it as a keepsake. Let the children place small amounts of clay in baby food jar lids. Give them small dried flowers to arrange in the clay. Help the children screw the jars onto the lids. Tie ribbons around the necks of the jars and let the children give them as gifts. Last year we painted terra cotta pots and then planted marigolds in them, they were really cute. Here is a Mother's Day Corsage that we made for our Moms last year. You take about 5 hard coloured candies the kind wrapped in cellophane. Wrap a chenille stick, that has been cut in 1/2, around the bottom of the candy. Roll all 5 chenille sticks together then you poke these through the centre of a small paper doily. So it looks like you have a little bouquet of flowers. Then tie a bunch of curly ribbon around and attach a pin in the back or you can give it to your Mom as a bouquet. Mix the food coloring in with the water before you add the water to the flour and salt. Mix it and knead it into a soft dough. Roll it out onto a floured surface. Have the kids press their hand down into the dough. Be sure to press firmly enough that the imprints are clear and deep, but not so deep that they go clear down to the table or surface. Then, take a toothpick and write their name and the year wherever you can find the space. I took a table knife and cut a big circle around the handprint and then poked two holes at the top of the circle so I can tie a pretty ribbon at the top of the plaque. Bake at 200 degrees for 2 or 3 hours, watching closely so that it doesn't burn. Easy, adorable, and a keepsake!! Take two milk caps from gallon jugs and hot glue them to the back sides of a laundry scoop to look like wheels. Tie a ribbon around the handle and plant seeds or transplant a flower into the pot with potting soil. It looks like a wheelbarrow. We are making flowers for Moms with egg carton cups. I shaped the cups a bit to look like flower petals. Today we painted the outsides. Tomorrow we will attach a pipe cleaner (tie a knot on one end and slide into a hole in the middle). Glue tissue paper squares (a bit larger than the egg cups) to the insides. They can roll up the tissue or wrap around a pencil and glue into it (like making a pinata). On Wedensday I want to decorate a juice can to put these into, but I'm not having much inspiration on what to use. My paint wont cover up words on the can completely. Any creative ideas? I saved the water color paintings the kids made yesterday to make into a card, so if I dont get any other ideas I guess I can cut them to fit the cans instead. Hey I had my kidos do this project we sprayed cheap perfume or air fresheners to spray the inside with so they would smell good. also for the bottles perhaps you could ask the parents to bring in the little 20 oz soda pop bottles. They look pretty neat and the paint we have worked pretty good on them. You make muffins with the kids & they decorate a brown lunch bag. Wrap a muffin & put it in the bag along with a tea bag & a pc of fruit. VOILA! Breakfast for mom on Mother's Day! For Mother's day I have put in my newsletter for each of them to bring in a t-shirt that fits mom and I am printing an iron-on transfer of their child. Simple but I think that they will enjoy it. Stuff the cap/cup (from a liquid laundry detergent bottle) with fiber fill very tightly then cover with material or felt and stuff into the cup/cap and then hot glue or use white glue, its easier to do the hot glue here. Then take a ribbon or rick rack (for those of you that dont sew, this is the zigzag trim that you can find in the trims section of a material store. )and glue it around the cup/cap near the rim, these can be really cute. My mom has __________________hair and ________________eyes. She is _________years old. Her favorite food is ___________________. For fun my mom likes to_____________________. I love my mom because ________________. I also leave room at the bottom of the page for the children to draw a picture of their mom. It is cute.